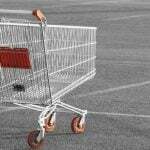 Today, the role of shop by brand functionality in ecommerce becomes more and more important. Unfortunately, the desired feature is not available in Magento 2 by default, but you can easily enhance your ecommerce website with a third-party module, such as MageDelight Shop By Brand. This Magento 2 shop by brand module improves a main menu, provides multiple ways to filter the brands, adds Magento shop by brand layered navigation, and offers other improvements. The most noticeable improvement the MageDelight Shop By Brand Magento 2 module provides is a separate menu item called Shop by Brand. It can either be a link to a page with all brands or contain sublinks to separate brand pages. Now, each brand can have title, logo, and description. As for sorting options, the MageDelight Shop By Brand Magento 2 extension allows to organize the brands listing in ascending/descending order grouping brands by name or position. Note that reloads are eliminated from the sorting process. Take the most out of the Magento shop by brand attribute by making any brand product as Featured. Note that corresponding products (brands) are displayed in a slider attracting more user attention. And you can easily add/delete values of the brand attribute. 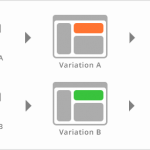 Each value can become SEO-friendly due to the appropriate backend section (we will describe this feature below). Also note that it is possible to import/export attribute values with MageDelight Shop By Brand Magento 2 module. Now, let’s take a look at the backend section of the extension to understand how it works. The extension configuration page is available under Stores -> Settings -> Configuration -> MageDelight -> Shop By Brand. It is divided into 4 parts: License Configuration, General Settings, Attribute Value Settings, and User Guide To Import. 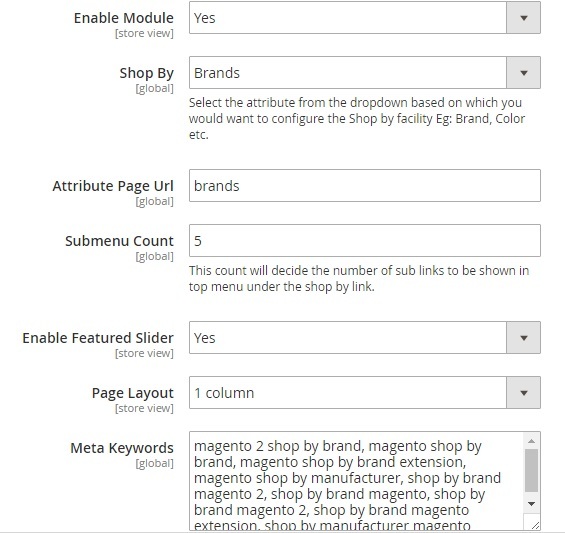 In General Settings, enable the module, select the Shop by attribute to configure the functionality of the extension (the necessary attribute is Brands), specify attribute page URL, add submenu count (the number of sub links in top menu under the shop by link), enabled featured slider with brands, select a page layout (1 column, 2 columns with right bar, 2 columns with left bar, 3 columns), specify meta keywords and description. 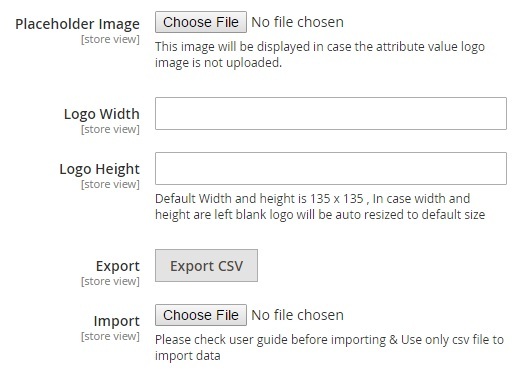 In Attribute Value Settings, upload a placeholder image that will be show if the attribute value logo image is not available. Next, specify logo width and height. Besides, this section allows to import/export a CSV file with attribute values. Next, go to Shop By Brand -> Manage Attribute Values. Here, you can view each attribute value as well as sync all values or export/import them. The appropriate grid shows value (brand) ID, logo, name, layout, parent attribute, URL key of a corresponding brand page, status (enabled/disabled), description, featured (yes/no), and meta description/keywords. You can edit or delete each attribute option separately. Besides, the MageDelight’s Magento 2 shop by brand module provides the ability to delete brands (attribute values) in bulk. The configuration of each attribute option is intuitive and user-friendly. The appropriate page contains 3 tabs: General Information, Meta Data, and Associated Products. 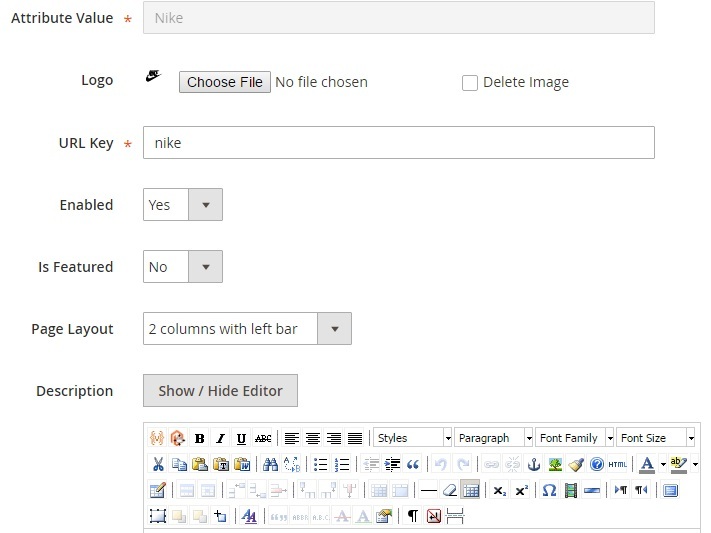 Under the first one, specify brand name (Attribute Value), add a brand logo, type URL key, enable the option and decide whether it is featured or not, select a page layout, and add a description. Under the Meta Data tab, type meta keywords and description. In Associated Products view/add/delete products related to the brand. As you can see, the MageDelight Shop By Brand Magento 2 module is extremely easy to configure. So now, when you know everything about the extension’s backend, let’s proceed to its frontend appearance. Hover over the Shop by Brands item of the main menu and Magento shop by brand dropdown will be displayed. 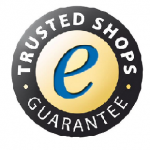 It contains all brands specified as values of the Brands attribute. As for the Brands page, it is divided into two parts: Featured Brands (options marked as Featured) and All Brands. The All Brands section contains all brands and allows to filter out the selection of brands alphabetically, by name or position, and in ascending/descending order. Besides, there is a search field with a kind of the autocomplete functionality. Everything is based on AJAX, so brands are displayed without reloads. And this is a brand page where all Nike products are displayed. 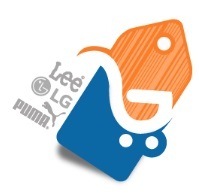 It displays brand name, logo, and description. Besides, you can see the URL key specified in the backend.